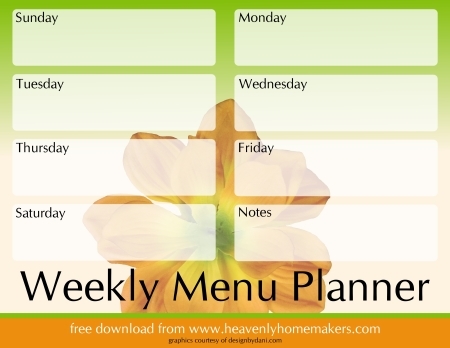 I have found that planning a menu each week helps make my homemaking much more heavenly! Spend a little bit of time each week looking at the groceries you have on hand and planning a menu that your family will enjoy. Feel free to look through all of our weekly menu plans to get new ideas and inspiration for meals that are well balanced, healthy and tasty! Want to write your meal ideas on a pretty menu planner? You’ll find a fun assortment of FREE Menu Planners here. Choose one, download and print it, write down your menu for the week and put it right on your fridge for a quick reference! Some people even print the menu planners, laminate them and use a wipe off pen as a way to reuse the menu planners. They’re free, you’re welcome to use them however you wish!